He get interested in house music in early 90 taking as reference Hernán Cattaneo, John Digweed and Martín Garcia. His sets are distinguished by a wide variety of sounds. Including his own editions shows his capacity to move the crowd with harmony, with a great taste for programming and excellent mixing skills. Those little differences, gives him a personal sound, making a very elaborated work which is reflected in his the interaction with the crowd. A good example of this was shown in La Vieja Usina (Córdoba, Argentina) playing for 6.000 people. He was called to play 3 times on Creamfields Buenos Aires and he has played with internacional artists as: Martin García, Deep Mariano, Guille Quero, Oliverio, Mos, D-Nox, Soundexile, Anne Marie X, Scott Bradford, Derek Howell, Fergie and many more. 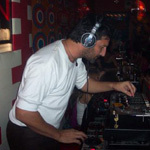 As a producer, his edit of the track “The Search” of Francesco Farfa was included in Hernán Cattaneo’s April 2005 Chart and also was played by several djs as Hernán Cattaneo & Martin García. Recently he was recognized once again by Hernán Cattaneo when he played his remix from the track “Atoms” from Tonnsaied in Alsina State. A&F releases on TRONIC, REPLUG & STRIPPED & interview! All times are GMT -4. The time now is 11:09:48 PM.